t-shirt collection, Nganana / All of Us, and art exhibition, Kungka Kunpu / Strong Women. NAIDOC Week is a time to celebrate the history, culture and achievements of Aboriginal and Torres Strait Islander peoples. 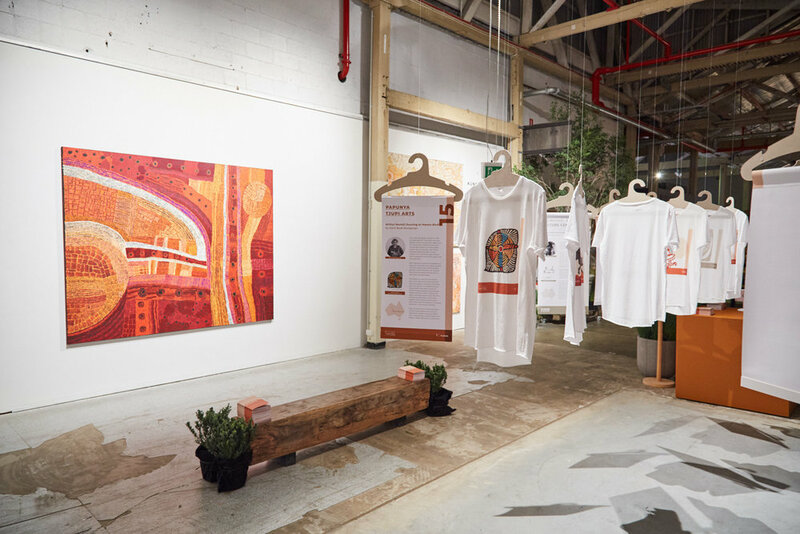 As a proud advocate for contemporary Indigenous art and design, it's a significant event in Koskela’s calendar. Kungka Kunpu / Strong Women is a nod to the much-lauded 2018 NAIDOC Week theme, Because of her, we can! Eight women artists from Iwantja Arts presented large-scale acrylic paintings that depict the Anangu Pitjantjatjara Yankunytjatjara (APY) Lands in far north east South Australia. Nganana / All of Us is a collaboration with 19 Aboriginal and Torres Strait Islander owned community art centres throughout Australia. Each contributed an original artwork for a limited-edition t-shirt collection that is available to purchase for $70 from koskela.co. All profits go back to the art centres and artists. We were proud to have both on display in the gallery, and Nganana in particular was a huge team effort to pull together. Collaborating with 19 art centres is no mean feat, but we were thrilled to have so many participate. 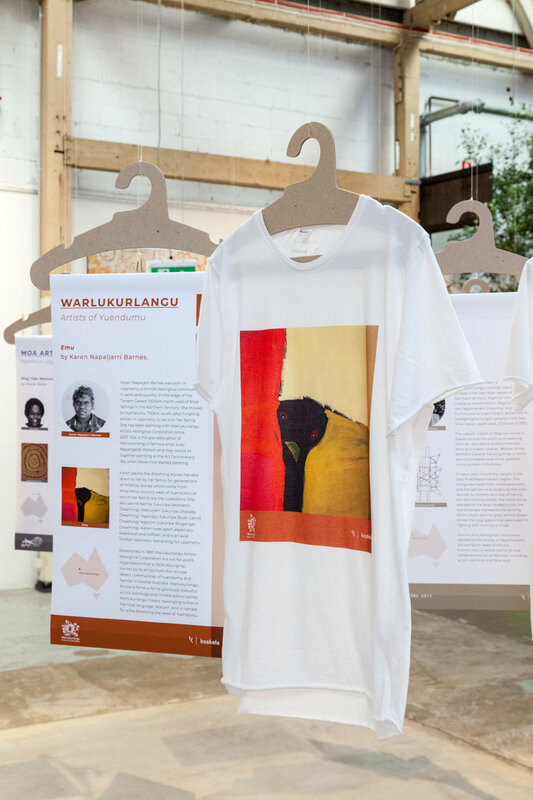 As a collection, these t-shirts capture the amazing diversity of contemporary Indigenous art around Australia. Being Koskela’s first foray into fashion, we decided that a Nganana t-shirt should become part of our retail staff uniform. But which one? We asked our customers to pick their favourite and hosted a People’s Choice Competition in store and online. The t-shirt with the most votes was Emu (pictured left) by Karen Napaljarri Barnes from Warlukurlangu Artists, an Aboriginal corporation owned by artists from the remote desert communities of Yuendumu and Nyirripi in Central Australia. Look out for our lovely retail staff wearing this design next time you are in store. For this not-for-profit project that supports Indigenous artists we wanted to spread the word far and wide, which was made possible thanks to our five young and talented Indigenous ambassadors. On Instagram, they were all kind enough to wear a Nganana t-shirt and share their thoughts about NAIDOC Week, which we have republished below. Ella Havelka - Dancer in the Australian Ballet. “This years NAIDOC theme allows us to celebrate all the Aboriginal and Torres Strait Islander women who are trailblazers and guardians of our beautiful culture. — Ella Havelka, Dancer in the Australian Ballet. Emily Wurramara - Singer and songwriter. “There are 52 weeks in a year why do we only celebrate our beautiful black women when it’s compulsory or when it’s convenient. We need to celebrate them every day, they have made so much sacrifice. We are sacred and that needs to be protected, loved and nurtured EVERY DAY. — Emily Wurramara, Singer and songwriter. “I want to acknowledge all the powerful indigenous women in my life, my grandmother, my six aunties and all my powerful cousins that have all made me a better man today. All the indigenous women within the entertainment industry who have paved the way for many more to come. Without these powerful women I wouldn’t understand the meaning of respect and the values of being nurtured. “It makes me think about my mother – she has been such a strong supporter of me throughout my life. She has taught me to be strong, resilient and self-sufficient. Without her, I wouldn’t be where I am today. 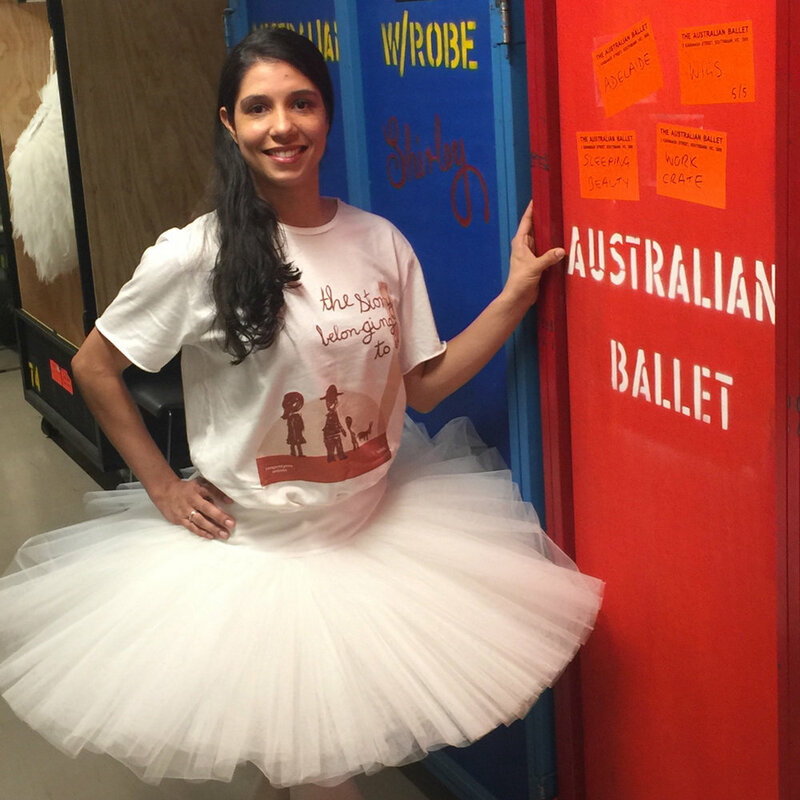 “NAIDOC Week means a celebration of culture for me. It’s a way for us to connect with culture and empower our people through our shared experience. It’s the freedom of getting together with our families, our communities and sharing our stories to learn together. Looking back on past events can be traumatic sometimes and retelling those events can be an incredibly hard path to take but with that comes strength. The empowerment through ownership of our stories and through our shared hardship makes us a resilient and proud people. Our shared past happened and we can’t let those traumas happen again. With knowledge we can learn from the past and take control of our future. “It is with retelling our stories through celebration and sharing language that makes us stronger as a people. My great Grandmother, was one of the last fluent speakers of Wiradjuri and it is because of her knowledge of culture that she could sit down and teach us about the language and how to say what. Without her voice, there would be less records to help form the basis of our modern Wiradjuri dictionaries and knowledge. It is because of strong women like Emily Towney, we can make a proud future and own our past, present and future. 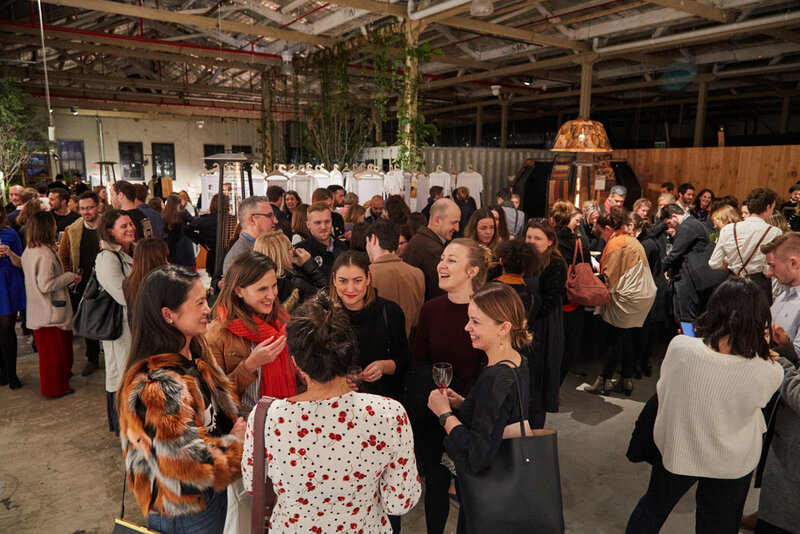 Koskela’s NAIDOC Week celebrations culminated in a soirée for VIPs, held on the Wednesday night. Emily Wurramara gave an acoustic performance and Hunter Page Lochard came along too. Guests feasted on a delicious spread prepared by Andy Allen of Three Blue Ducks and enjoyed refreshments from our generous sponsors The Drink Hive, PS Soda and Frenchies Beers. It has been an honour to exhibit Kungka Kunpu and collaborate on Nganana to support Indigenous artists and art centres. We are so proud of the success of both and it is with mixed feelings that we wave goodbye to NAIDOC Week for another year.